Lichfield Drive Bridge at Shugborough Park in Staffordshire. Photo taken by Paul Hunt, used with permission. The United Kingdom is famous for its numerous, rather ornamental bridges- some made of steel, but many made of concrete and/or brick. This bridge, located at Lichfield Drive in Colwich, in the district of Staffordshire, is one of those examples that stand out as a unique ornamental bridge made of concrete. Once spanning a railroad line that is now a path, this bridge, according to records from English Heritage, was built in 1847. The main span is a closed spandrel elliptical arch bridge made of brick. A figure head is at the keystone of the arch span. Columns on both sides support the remaining structure with lower rounded ballustrade railings curving over the bridge from piling to piling. Rounded engraved medallions can be found on the stone blocks on the outer edge of the bridge on the deck, and sculptures can be found on the bridge’s ballustrades. The bridge is uniqueness in design is overshadowed by the lack of information available on the structure. In particular, we do not know who built the bridge, let alone who was behind the design. England has had many engineers who left their landmarks in history, including I.K. Brunel (who built the Clifton Suspension Bridge), Sir John Fowler, who built the Firth of Forth Railroad Bridge, and Thomas Telford, who masterminded the construction of numerous railroad bridges. But we do not know who built this bridge, whether it was the aforementioned engineers or someone else. This is where your help comes in. 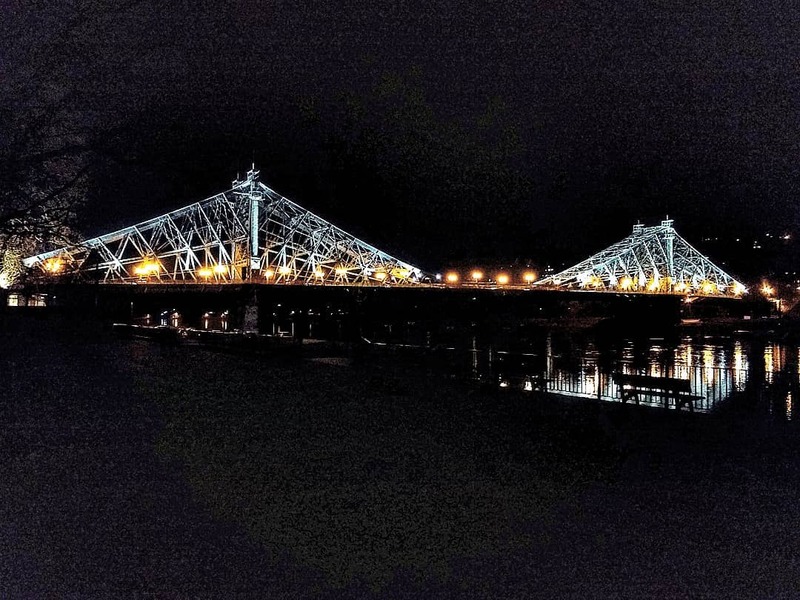 If you know of the history of this unique bridge that you would like to share, please add your comments below or contact Jason Smith at the Chronicles, using the contact information in the About the Chronicles page. You can also add your comments in the Chronicles’ facebook page as it is also a platform to discuss the history of this bridge. The author would like to thank Paul Hunt for allowing usage of the bridge. Please click here to find out where the bridge is located. Map courtesy of Google Map. As a railway postcard collector, I always search for details about the subject and for the Colwich Railway Bridge (pictured on a “L&NWR official” in my possession), Google directed me also to your interesting website (which I bookmarked for future reference on railway bridge details. Thanks!). In reply to your question for more information on subject bridge, I like to share here my findings and thoughts. In your comments you say that the bridge is spanning a railway, but in my opinion was the bridge built to carry a railway: the Trent Valley Railway (TVR, est. 1844) to connect Rugby and Stafford. Works on this railway started in 1845 (under direction of a.o. Robert Stephenson), but already in 1846 the TVR was taken over by the London & Birmingham Railway which in that same year then amalgated with the London & North Western Railway (L&NWR). Very likely it was John William Livock (1814-1883), the in-house architect of the L&NWR, who designed the bridge: his works include many stations and a “bridge on the Shurborough Estate” in 1847. Also the portals of the Shurborough Railway Tunnel are from his hand. It is to be noted that both the bridge and the tunnel portals are “estate worthy”, i.e. designed to fit their environment (Shurborough Hall / Park / etc.). The bridge is located approx. 1.2 km West of Colwich Junction and today very well visible with Google Earth (52°47’17” – 2°00’20”) and carrying the 2-track, electrified railway Rugby – Stafford. This view also made me believe that the bridge never spanned a railway as that one would run straight into the Estate to ….. where? Moreover, I have an old railway map of 1907 which does not show at this (bridge) location a crossing of railway lines. (btw: your locator on Google maps in your comments is slightly out of place: it should be on the grey [railway] line). The bridge is depicted on an official postcard of the L&NWR, issued November 1904, with the caption “Old railway bridge near Colwich”. Also on the postcard there are no tracks to be distinguished under the bridge but rather a, for that period, neat drive-way. The word “old” in the caption might be a bit puzzling: the bridge was certainly not old (in terms of “former” or “disused”) as also in 1904 it carried an operational railway line. Maybe “old” is here to be interpreted in terms of classical (design). I do think that the bridge (also) served as an ornamental entrance (portal) to the Shugborough Estate. The crest on top of the bridge (could not identify it yet), the sculptures (animals) and the bays (on top and sides) for maybe statues, are not the type of decorations you generally find to “welcome” a train but rather to impress visitors entering the Shugborough Estate. If I come across more / better information, I will of course share that in the future. If you are interested in a copy of the 1904 postcard, I happily send that. Permit me to solve the mystery for you. I’m Robin Mathams, joint historian of The Trent Valley Railway History Project and Member of the LNWR Society. 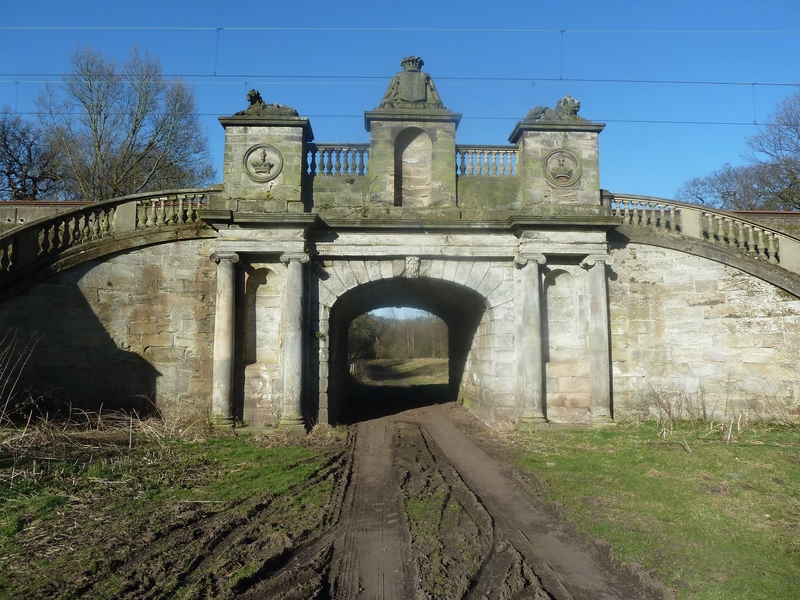 As Hein de Jong states, the bridge and the Shugborough Tunnel portals were probably designed by John Livock, the TVR’s consultant architect, but so far, no evidence has been found to verify this. It was constructed by Thomas Brassey and Partners as part of their contract to build the railway, and it was built of dressed stone from the nearby Tixall and Weston quarries. There is no brickwork in the structure. What is not known is, if Brassey was paid any extra money for what was an expensive bridge. The bridge is Grade 2 listed and still in its original condition, unaltered since its construction and it is currently cared for by Network Rail who undertaken regular inspections and for its age, the bridge is in fine fettle. Brassey’s contract to build the railway initially was with the TVR Co. which was bought by the London & Birmingham Railway Co. on April 15th 1846 and the L&B then became part of the London & North Western Railway on its formation on July 16th 1846 which took over Brassey’s contract. Hein de Jong also states that the TVR’s consulting engineer was Robert Stephenson – in fact he was one of 3, the others being George Parker Bidder, and Thomas Gooch who was also appointed the line’s chief engineer, to whom James Berkley directly reported. Stephenson had virtually no involvement with the construction of the railway, but did get involved with the testing of some of its underline bridges – which was the cause of the 3 month delay in opening the railway. Robin Mathams: thanks for completing the story with these interesting details. Great information to add to my postcard. Shugborough tunnel ventilation shafts, allow me to clarify. Contrary to what many people believe (including Network Rail) there never were any. There were, however, 7 main construction shafts, 2 auxiliary shafts, and one trial shaft sunk near to what would become the northern portal. This made a total of 10 construction shafts, all of which were infilled and capped when the tunnel was completed. It is probably the very limited knowledge and understanding of these shafts which has given rise to the mistaken belief they were ventilation shafts. The method of excavating the tunnel was; at the base of each shaft two headings were dug out in opposite directions and these eventually joined up with their adjacent headings, and this method of using shafts also helped with the navigation of the tunnel route on the ground above. The spoil from excavation was removed by large buckets taken up the shafts. We know the precise locations of the shafts, but rest assured there is no trace of them on the ground above the tunnel – we’ve looked extremely hard! There is certainly no trace of them inside the tunnel because as previously stated, they were blocked off by the lining applied when the excavation was completed. The excavation took 12 months with the lining and portal construction taking a further 7 months which means the entire tunnel was constructed in 19 months. The cement and brick lining was 18 inches (45cm) thick and because of the very dense nature of the ground, through which the tunnel was bored (a conglomerate of small stones in a red marl), applying the lining as the excavation proceeded was considered unnecessary and this also made life easier in not having to lower the lining materials down the shafts. Again, because of the dense nature of the ground, much use of gunpowder for blasting was required (dynamite had yet to be invented) thus adding to the hazardous nature of the work and again, because of the dense ground, the railway inspector who inspected the tunnel, noted that the tunnel had no invert – this is the curved part of a tunnel’s structure below track level to increase stability. Because of the difficulties of excavation Thomas Brassey’s costs escalated by £32,000 but fortunately he was eventually recompensed by the LNWR. Of human casualties, so far, we know of one death caused by a collapse inside the tunnel, and three men being blinded, all of whom were well looked after by Brassey. The tunnel is 777 yards long although the Bradshaw’s guide at the time quoted 779 yards. The bore is 28ft (8.5m) wide at rail level and 23ft (7m) high with an air volume of 33,000 cubic metres which relates to around 69,000 tons of spoil excavated. The railway through the tunnel has a rising gradient of 1 in 330 from the north to a summit 280 yards south of the south portal. The south portal represents an Egyptian temple, and the north portal a Norman castle. The tunnel and its portals were granted Grade II Listed status in 1953.